Amid the arid mesas of the American Southwest, many Native American Indian Pueblo Nations have carved out a sustainable life and culture. Sustenance of these cultures has depended on few crops—maize (corn), squash, beans and tobacco—and the elements that make these crops grow—rain and sun. Native American Indians’ pottery often reflects the reverence for everything that sustains their way of life, including traditional seed pots. Traditionally, seed pots were used to store just what their name suggests—seeds. But these containers were different from other Native American Indian pottery wares. Seed pots were designed to protect the seeds for next year’s planting from rodents and insects. A wide-mouthed vessel like a traditional bowl, jar or olla could not keep vermin out. So, seed pots were created with only a tiny hole that would allow one seed to be dropped in at a time. When the time for spring planting came, the seed pots would be smashed so all the seeds collected during the winter months could be used. Today’s Native American Indian seed pots do not have the same utilitarian function. 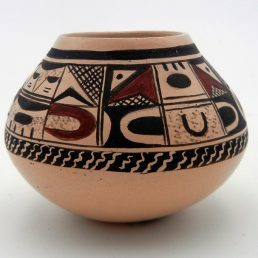 Instead, seed pots as pottery art are created as a way to preserve Pueblo culture and values. They do this in both their construction and their decoration. Native American seed pots often have a shape similar to traditional seed pots—a narrow base that widens toward the top. The openings for these pots are usually on the top. However, some artists are playful in the placement of the seed opening, hiding it within the design, but it’s always there. 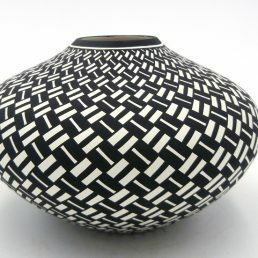 Seed pots often reflect the characteristic styles and designs of the artist’s Pueblo’s pottery traditions. 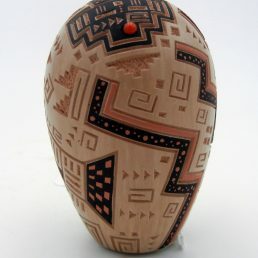 For instance, Acoma Pueblo seed pots are often decorated with fine line geometric patterns. 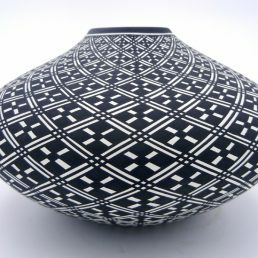 Jemez Pueblo pottery artists carve geometric designs into red-slipped buff pottery. Palms Trading Company carries a variety of seed pots so that you’ll be able to find that unique piece to add to your collection. 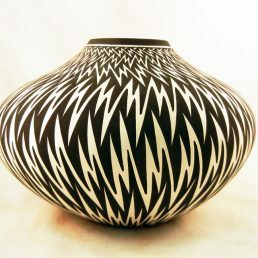 Every pot is hand-crafted by artists from local Pueblos, so it guaranteed to be authentic Native American Indian art. If you don’t see quite what you’re looking for, please contact us. 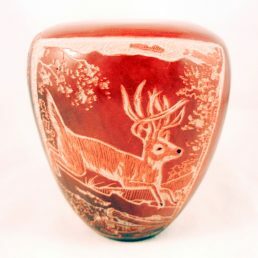 Our personal shopper can show you more Native American Indian pottery from our larger in-store selection.